Why do fair & impartial courts matter? Amending the Florida Constitution and the role of the courts. Judging candidates for judicial office. Testing your knowledge of what’s in the U.S. and Florida constitutions. Each activity comes with an overview, handouts and is guided by a PowerPoint. All materials can be downloaded from The Florida Bar website. Attorneys can receive CLE credit for making Benchmarks presentations. Benchmarks presenters can earn one ethics credit hour for each presentation for up to three presentations in a three-year reporting period. Form to apply for credit. 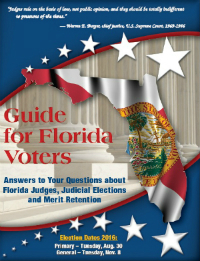 Find resources about merit retention elections, the Guide for Florida Voters, and review the Judicial Candidate Voluntary Self-Disclosure Statements. The Florida Bar partners with the Informed Voters-Fair Judges Project of the National Association of Women Judges. The goal of the partnership is to increase the knowledge of citizens regarding the importance of a fair and impartial judiciary. Florida Supreme Court Justice Barbara Pariente is co-chair of the National Association of Women Judges, Judicial Independence Committee. Fair & Impartial Courts means that judges are free to decide cases fairly and impartially, relying only on the facts and the law. It means that judges are protected from political pressure, legislative pressure, special interest pressure, media pressure, public pressure, financial pressure, or even personal pressure. Judges must be fair and impartial to all who come before them; judges must be free from partisan political influence; judges must rule on the basis of what is just, not just what is popular; and judges must be able to protect ordinary citizens from politicians, government, large corporations, and from each other. #JustAdulting page and app for high school or college students. For as long as our great nation has existed, the separation of powers among three branches of government has worked to protect and defend our freedoms. The three branches also have the power to “check and balance” each other so that each clearly has its own responsibilities – the legislative branch makes the laws; the executive branch enforces and carries out the laws; and the judicial branch interprets the laws. For example, Congress may pass laws but the President can veto them; the president can veto laws but Congress can override the veto with a 2/3 vote; and the President and Congress may agree on a law but the Supreme Court can declare a law unconstitutional.